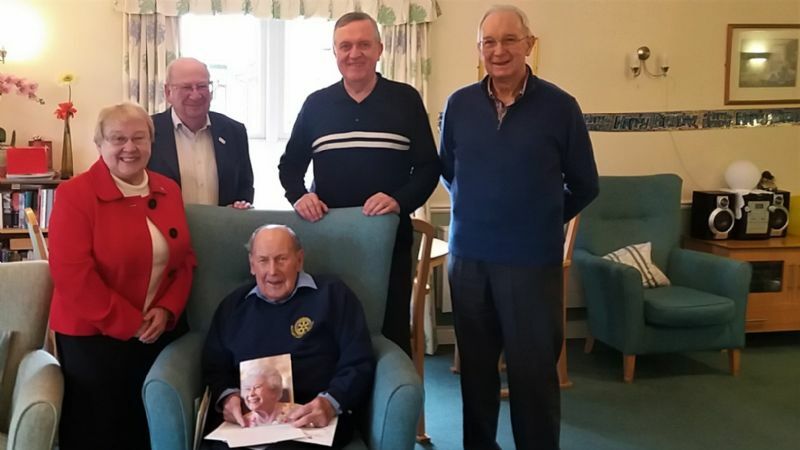 Four members of The Rotary Club of Bolton recently visited fellow Rotarian Stephen Greenhalgh who was celebrating reaching the amazing age of 100. Stephen became a member of the club in 1953 and so he was also celebrating being a member of Rotary for 65 years and continues to be an honorary member. Is this a record? Stephen is very alert and told many tales at the visit as he often did when he was a regular at the club meetings which he does not attend now. He is seen in the photograph with his card from The Queen and proudly wearing his Rotary Club of Bolton sweatshirt. Not many weeks after this Stephen was seen attending an evening concert showing that he still enjoys life as full as he can.